It’s the valley of the Arno, or better known as the Valdarno, that is told and illustrated in this issue of Toscanadove.it a beautiful and impressive magazine printed by Printed scratches. In the heart of Tuscany pristine, rich in history, tradition, culture and taste this land is told and illustrated in an excellent way in this beautiful magazine. Browse its pages gives us the feeling of traveling through time and history of this land. 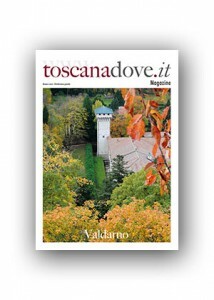 And also in the printing of this beautiful magazine our Screening Sublima was crucial to reproduce and enhance the colors of the land and the atmosphere of Tuscany. In cm.24×33 format, 96 pages in addition to the cover, the paper used for the interior is a glossy coated from gr.130 for the cover and a glossy coated by 250 gr, the cover has a gloss lamination outside. The scratches Printed thanked the publisher Eurofoto for choosing our company in the printing of this publication. THE FRONTISPIECE: what is it?